In 1911 the world was watching, waiting, hoping, attention focused on a desolate spot at the very end of the earth, as two men raced to conquer the South Pole. A hundred years after Roald Amundsen's triumph and Robert Scott's tragic demise, our fascination with the Antarctic remains as acute as ever. 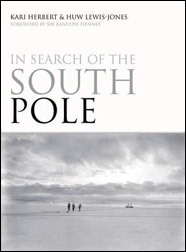 On the centenary of their epic expeditions, this book traces our search for the South Pole, from the earliest encounters with Antarctica's icy waters, through the Heroic Age to modern times. In addition to the words of Scott and Amundsen, vivid descriptions from the logbooks, journals and narratives of pioneers such as Carsten Borchgrevink, Ernest Shackleton and Douglas Mawson provide first-hand experiences of this enigmatic and unforgiving region. In our own times, there is commentary from modern explorers and travellers, writers and scientists, who explain what the South Pole means to them. Among those featured are Edmund Hillary, Vivian Fuchs, Ranulph Fiennes and Borge Ousland. Stunning images by Herbert Ponting adn Frank Hurley, and from the personal collections of explorers and adventure photographers, as well as contemporary ephemera and artefacts illustrate the hardships of life on the ice. The authors, Kari Herbert, daughter of the great polar explorer Sir Wally Herbert, and Huw Lewis-Jones, former Curator at he Scott Polar Research Institute, have woven together the narrative of this enduring human quest with the individual stories to place the Scott- Amundsen race in historical context and consider its legacy in the manhaulers, extreme skiers and adventure tourists of today. In the twentyfirst century the South Pole remains an international stage for ambition and personal endeavour. For anyone who has felt the pull of this magnetic place - this is the book for you.